Start a visit to Aarhus Art Museum, ARoS, in the center of Aarhus. With 20,700 square meters, ARoS is spread over 10 floors and one of Northern Europe's largest art museums. Both architecture and art are in international class, and both offer experiences of high karat. On top of ARoS, the Danish / Icelandic artist Olafur Eliasson's permanent artwork, Your rainbow panorama, floats. Your rainbow panorama. 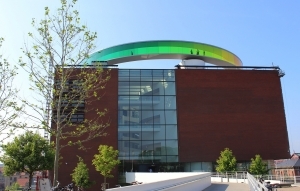 The rainbow, in daily speech, is a 150-meter-long and three-meter wide circular round-trip made of glass in all the colors of the spectrums. The rainbow offers a sensational change with extraordinary views of the surrounding city and Aarhus bay. Take bus 100 from Tangkrogen and stand a few meters from the museum entrance or hop on the bike. The museum can also be reached on foot if you have the courage of a little longer walk. Along the stream are the cafes side by side. The committee is the vast majority of classic cafe dishes like club sandwich, burger and pasta in one form or another. Prices are not the cheapest in town, but the atmosphere and the location in the sun are worth paying for. The cafes on the river are just a stone's throw from the ARoS, so hop on the bike or stroll along the cleared all the way from Mølleparken until you reach a cafe you like. After lunch you can continue the trip to Aarhus' oldest district, the Latin Quarter, located a few hundred meters from the stream. The Latin Quarter has its current name in the 1990s, as it has many similarities with the famous neighborhood in Paris of the same name. The narrow streets with topped cobbles and beautiful houses offer very special picturesque experiences. The neighborhood is filled with a mix of specialty shops with exciting offerings, craftsmen's workshops and cafes / restaurants inviting menu. 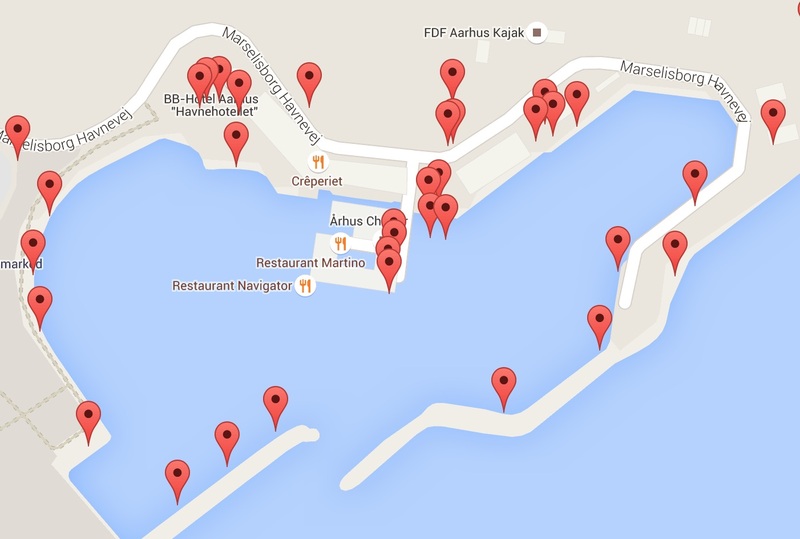 The port of Aarhus has undergone major changes in recent years. A new residential area, Aarhus Island, has been erected with architecturally exciting properties, of which the iceberg is the most mentioned. Closer to the city center, Bestseller's new office, as well as Navitas and Dokk1, form the framework for a urban harbor environment that brings the sea closer to the city. The beach bar is part of the new life at the harbor. With the help of a pair of containers, abundant amounts of sand and colorful sun loungers, the Strandbaren makes every effort to create true beach atmosphere in the middle of the harbor. Refresh yourself with nachos, delicious drinks, ice cream, juices or smoothies with a prime view of the sea and the city. Are you the active types, you can take a game of ping-pong or beach-volleyball on one of the landscaped lanes. Hop on the bike or stroll out to the harbor, which is only a quick walk away from the city center and the Latin Quarter.